I didn't know how to react when Tobie excited picked up a copy of Happy Salmon while we were browsing board games. As is often the case, he had heard about the game somehow and was VERY happy to see it in stock and tried to quicky explain the game mechanics while we were at the shop. As much as most of our games are a lot more complicated and require some serious thinking, we're not immune to the lures of a good party game. And this family-friendly game is proving to be one of the more brilliant ones that is becoming quite popular in the convention circuit because of course it is. And in our own experiences of playing the game, it truly is proving to be a very fun game indeed. 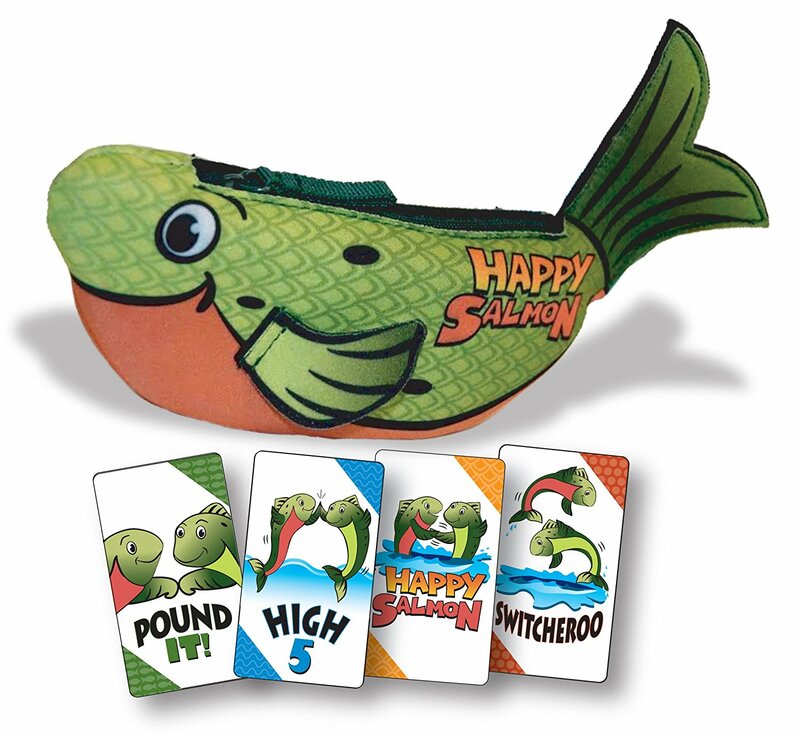 Happy Salmon is a card-based party game that is good for 3-6 players with a single copy of the game. It was designed by Ken Gruhl and Quentin Weir and can expand to 12 players with a copy of the blue "expansion" salmon. The rules for the game are simple. Each player has a deck of cards that they need to get rid of to win the game. They do this by finding other players with the matching card active and performing the card action as directed. Thus far there are four separate actions. Pound It means you need to fist bump the other player. High 5 of course means to make a high five. 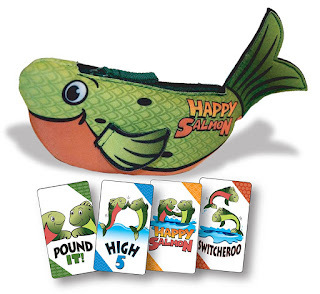 Happy Salmon means you and other player slap each other's forearms in a fishy motion. And Switcheroo means you trade places with that player. The game does require a bit of space to play and even if players seem to stay in their fixed positions, the Switcheroos inevitably lead to some movement and you'll lose track of your own actions the more cards you get rid of. The game has some variant play modes including a silent mode where you use hand gestures to indicate what card you're holding and this is its own brand of fun. What I Liked: The game is brilliant in its simplicity as it's essentially a more dynamic game of Go Fish. It's super easy to learn and loads of fun across age groups. Our play group has been favoring the "silent" play option only because it has everyone laughing in their efforts not to say anything while gesturing wildly. It's hard to explain in words but thankfully the internet is filling up with videos of different people playing the game with increasingly larger groups. Happy Salmon is a great example of a familiar game (in this case Go Fish and its variants) with a slight innovation to the game mechanics into something better. Turning the cards into actions and reducing the possible items to match all came together to create a pretty brilliant and celver game. What Could Have Been Better: The game still has the chance to "break down" when you somehow end up with no winner within your group for some reason. Matching certain cards first can lock you all out of victory - and I can only cite experience in terms of how this happened. It's not a common problem but it can happen. There is that slight wish that there was one more card variant to increase your options when you play. But of course I respect that they probably did a lot of play testing to figure out that this mix of four card types was enough to lock things in. Or maybe they left the door open for an expansion? TL;DR: Happy Salmon is a simple but really fun party game that will change your social events forever. Just make sure you allot enough space and remember that the Happy Salmon gesture is my favorite. Thus the game gets a solid 5 silly things that will inevitably happen when you play this game out of a possible 5.